This was the start of my focus addiction. I was working at a Pontiac/Buick/GMC Dealership and I was driving a 1987 Pontiac Fiero GT around which was less than reliable. I loved the Fiero and I wanted to stop daily driving it and get something a bit more fuel efficient. I looked around on the lot at my work and test drove the new Pontiac Vibe and the Pontiac Sunfire and was less than impressed. I took my father’s suggestion of check out the offerings from Ford and made my way to a local dealership. I looked at the Ford Rangers and the Ford Focus’ on the lot and quickly realized that the Ranger was beyond my financial reach for the one I wanted. The available focus’ were ugly, and very few with manual transmissions. My options were white, yellow, and black. One of the main things I hated was the black door handles and door rub strips. It really clashed with the rest of the car. This made my choice easier and I decided to get the black one as it all blended in together. I got a great price, great APR and my monthly payment of $149.00 was easily made. The following morning, I drove to work in my new focus and was fired for it. I have the satisfaction of knowing that the dealership didn’t last but 3 months after my departure. I drove the focus around to job hunt and was beginning to fall in love. I decided to take the car to Ed Hanson’s Muffler shop where I had my Fiero Exhaust installed and decided on a Flowmaster. I was concerned that it would sound tinny like a honda, but Ed assured me it wouldn’t. Once it was done, I was happily surprised to hear the car sounded more like a Ford Ranger. After the exhaust was installed, I didn’t realize it yet, but I caught the bug. A store at a local mall called Flexivity sold aftermarket parts for cars like the focus so I decided to check it out. When I arrived, they were having a closing sale. 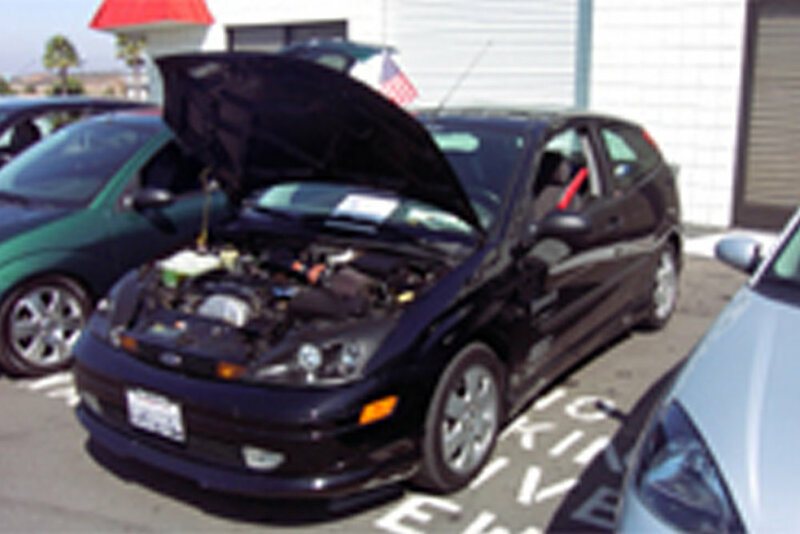 Come to find out, the store was a pilot store for Ford for vehicle customization. I told one of the clerks what I drove and her eyes lit up. SHe ran to the back and had two boxes and her coworkers arms full of body kit parts. By the end, for only $250, I made out with Hella Projector headlights, and complete Wings West W-Type body kit which was already pre-painted to match my car! I also got a set of Ford Racing Altezza Taillights, but I took one look at them next to the car and returned them. Following the bodykit and headlights, came an Esslinger UDP and K&N FIPK which added a couple HP and a Sony Xplod Sub with Alpine deck bumped hard inside. Thanks to a couple of vandals from the old ‘Bum Fights’ video, the car was just about totaled from a very large fist. It was fun while it lasted.